This post is the first of many to be done in cooperation with Deconstructor Of Fun. As announced by BothGunsBlazing, Anil Das-Gupta and I are joining forces with DeconstructorOfFun.com. Deconstructor has been an amazing resource for me and many mobile free to play designers around the industry so it’s an honour to be contributing to such an exceptional site. A big thank you to Michail Katkoff, Anil Das-Gupta, Dave Cross and Alex Collins for their help with this post. Looking forward to what’s to come! Turn back the clock only one year, and it felt like the matching/puzzle game genre was locked up and dominated by one player: King. Since last year, things have changed. King’s still on top, but there has been a new contender slowly moving up the charts. Playrix, a veteran casual game developer, has created two huge hits on mobile: Fishdom and Gardenscapes. In particular, each of these games has shown that there is more than one way to monetize off a puzzle game audience. Gardenscapes: New Acres by Playrix has now been a staple in the Top Grossing charts since September 2016, showing no signs of fading. Gardenscapes has made many companies within the puzzle genre turn their heads. It’s the first major successful innovation in the puzzle genre since 2012 when Candy Crush launched on mobile. So what has Playrix done with Gardenscapes that so many have failed to do? To understand the success of Gardenscapes, we have to go back to the history of Playrix and the Gardenscapes brand. Playrix as a company started in 2004, building casual downloadable games for PCs. They specialized in matching and hidden object games. Playrix during its early days released many successful titles like Fishdom, Gardenscapes, Farmscapes, 4 Elements and Royal Envoy. It’s interesting to note that King.com, Big Fish, PopCap and Playrix all competed within the casual market in these formative years. It’s not a coincidence that many of the top puzzle game developers today competed back in the casual PC market more than a decade ago. 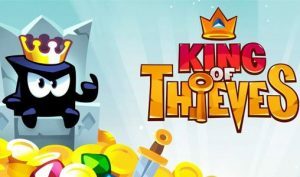 Similar to the competitive market of launching casual games in 2017, developers during the casual PC downloadable era fought to try to stand out with new mechanics and new themes. 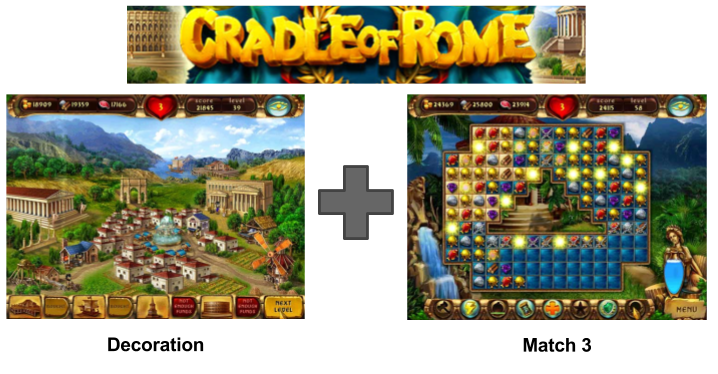 Casual game companies attempted to innovate on the match 3 formula by adding simulation elements, decoration elements, darker themes and narrative elements. 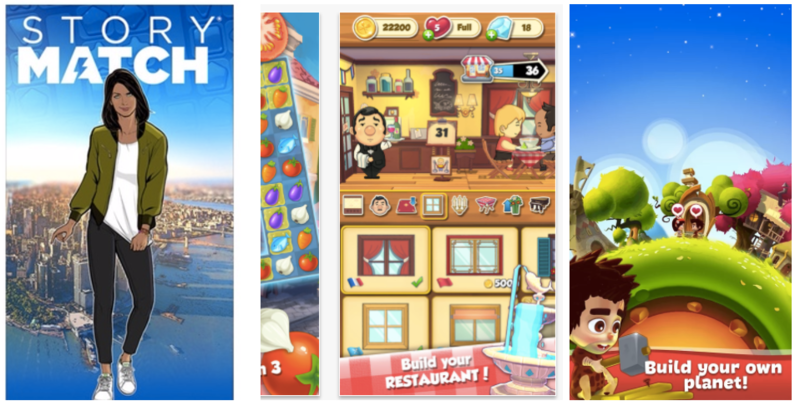 PlayRix competed in a market from 2004 which mimicked the competitive trends we’re seeing now on the AppStore. They’ve seen the cycles that match 3 players go through after playing too many bejeweled clones. Focusing on narrative & decoration had already been proven, only 10 years prior. By 2009, Playrix moved into Free-to-play and launched their first simulation game, Township, onto Facebook. By 2013, they had redesigned and launched Township on mobile. After porting over Fishdom, the pressure was on to port over their Gardenscapes IP. Gardenscapes on PC actually was not a matching game, but a hidden object game. As you can see from the above video, it was less about decorating a garden and more about running a bed and breakfast, looking after the guests that come visiting. What’s interesting is comparing these old games to now — the characters, the animation style, the UI/UX design have all stayed consistent with the latest New Acres release. So when it came time for Gardenscapes to follow in the footsteps of Fishdom and Township, this would have been PlayRix’s first Hidden Object game in free to play. According to VentureBeat, Gardenscapes for mobile was in development for over four years. It can’t have been an easy project. 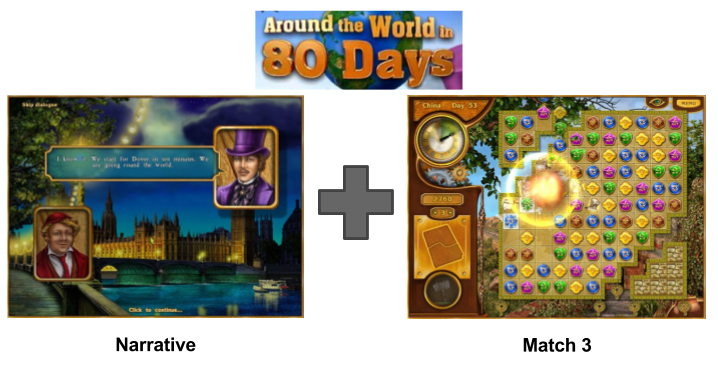 During the course of this soft launch, Playrix decided to shift their strategy from making a Hidden Object game to making a Match 3 game. This decision can not have been an easy decision to make. Most developers would sooner throw away a game than make such a drastic change so late in development. Regardless, PlayRix ported over the matching gameplay from Fishdom (their only mobile match 3 game at the time) and soft launched again in 2016. Playrix must have seen promise with shifting away from Hidden Object, because after this change to matching gameplay, Gardenscapes grew to become the success we know today. So why is it that the match 3 gameplay turned Gardenscapes into a hit? For creating long lasting free to play games, a match 3 style core will always beat out hidden object style core. It comes down 2 reasons: the scalability of content, and the ability to monetize from the core gameplay. 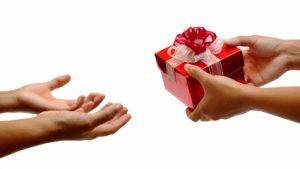 As discussed many times before, driving the most value from your content is imperative to free to play success. In content driven games like Hidden Object and Matching games, where players rip through content quickly, it’s increasingly important to minimize the amount of time it takes you to build content while maximizing value and replayability of this content. Matching games have a huge leg up when it comes to the simplicity of creating new content. As I discussed in my GDC talk regarding the scalability of content, Matching games typically take about 6-8 hours to produce one level. This includes concept, implementation, balancing, testing, and polishing. The actual content in the level (the art, the mechanics, the pieces) are all reused many times throughout all levels, and players are usually asked to replay the same level multiple times before progressing. Thus, content is relatively easy to produce and players are happy to re-play similar content over and over. This is a healthy content cost. To create content in Hidden Object games, the process is significantly more expensive. There is the arduous process of creating the backgrounds, the pieces in the scene, on top of the level design and balancing of each level. This content is far less likely to be repeated through multiple scenes — each scene has a new colour palette and lighting is completely different, using the same content over and over makes the scenes feel awkward and easy to spot. Objects which don’t have the same shadows or obviously look pasted onto a scene make the gameplay trivial. Content takes significantly longer to produce for each hidden object level, content can’t be easily reused, and game designers have to get really creative at pushing players to replay the same level over and over again just to keep a healthy content consumption for their players. As a result, Match 3 games can create more content significantly faster than hidden object games can, and this content can last longer. This is exactly what you’re looking for in a content-driven game. The biggest difference between a Hidden Object core gameplay and a matching puzzle game is that a puzzle game can effectively monetize off its core gameplay, where as a Hidden Object game can’t. 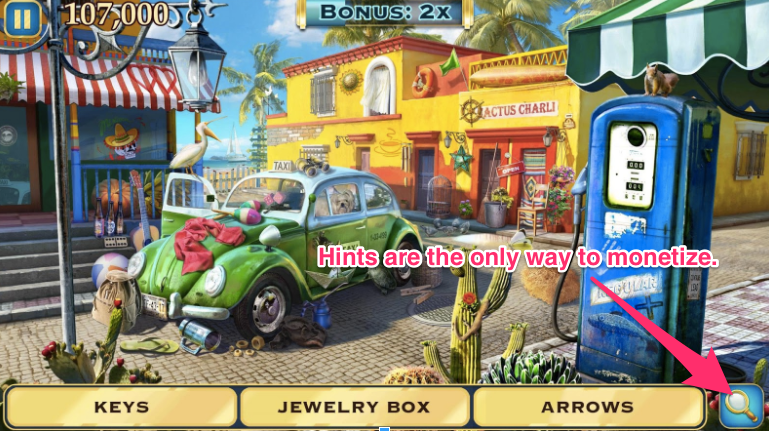 Hidden Object games typically monetize only through hints. Can’t find an object in the scene? Use a hint to let us guide you to the object. This helps players finish a level, but isn’t nearly as powerful a driver as +3 moves or in-game boosters in match 3 games. Why? Because hidden object games don’t have failure states. 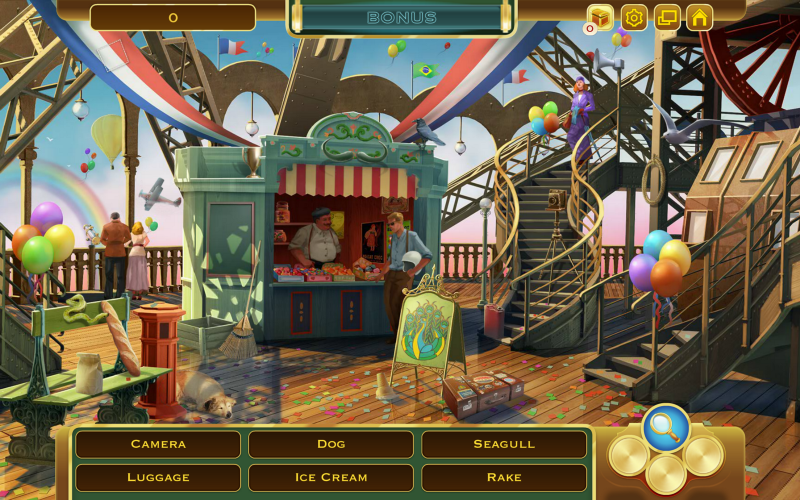 In Pearl’s Peril, Criminal Case and the original New Acres release (as seen above), a player can only maximize their score in a level, there is no chance that you can lose a round. Hidden Object games incentivize players to find all objects in a limited time, but they don’t have a state where a player can’t progress in the level. Most Hidden object games instead monetize off of pushing players to grind a stage multiple times over rather than block the player from progress whether they win a level or not. As a result, Hidden object games typically have to get far more creative to monetize off their player base, usually relying significantly more on a timer-filled metagame in order to pace players. Conversely, match 3 games can monetize very effectively off their core gameplay. Because there is a failure state (you can run out of moves before completing the level), players are invested in winning the level to progress. 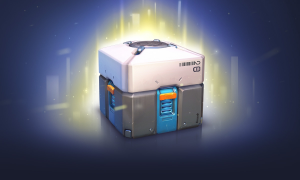 When running out of moves, players are incentivized to use premium boosts to win the level, or else they will lose all their progress in the level up to that point. There is significantly more pinch to monetize in matching games over hidden object. On top of being able to monetize through boosts, match 3 games can pace through luck, rather than only skill. In an excellent GDC presentation, Florian Steinhoff directly talks about the power that luck has in pacing players. Due to luck, level designers can ensure that all players, regardless of skill level, are paced appropriately within a level. Match 3 games contain so much luck that designers can balance each level with a fair degree of certainty that players of all skill levels will come close to winning even if they lose — the recipe for strong retention and strong monetization. Hidden Object games, with their pre-placed objects and skill driven core gameplay, can’t boast the same. As a result, Gardenscape made a very important design decision. Rather than allow players to purchase stars to progress through In-App Purchases, in Gardenscapes you can only purchase coins, which can be turned into boosts, lives, and extra moves. They fully leaned on their matching gameplay to monetize rather than allowing players to ignore the match 3 gameplay and skip ahead. This is the critical reason why Gardenscapes as a match 3 game monetizes so well. By only allowing purchases of boosts, players can’t buy progress, they have to earn it. Players have to roll the dice with the match 3 gameplay in order to unlock the content that they want, and these levels require plenty of patience or boosts to win. PlayRix’s swap to a match 3 core seemed to have paid off. But while they moved to matching as a core, they still kept the metagame of their original hidden object game. By keeping the narrative and the decoration aspects it separated Gardenscapes from all other matching games while leveraging all the content they had already built. Gardenscapes has a compelling narrative which drives the game forward between match 3 gameplays. This style of narrative may not be your preference, but the light narrative of slowly cleaning up and building out your garden is clearly compelling for their target audience. It’s refreshing to see more free to play genres prove the impact of narrative on retention. A story can be just as compelling to pull a player a long as a saga map or a leaderboard, if done right. On top of a long, overarching narrative, Gardenscapes allows its players to choose how to decorate their garden as they rebuild it. Players slowly rebuild a massive overgrown garden. As you clean up the areas, you’re allowed to decorate it. But the key decision here is that players are only allowed slot based decoration. Instead of allowing players to place decorations freely, they can only choose from a limited set of decorations in any area of the game. See for example the lampposts above — this can only be chosen from 3 different styles, and it replaces all 4 instances. This of course lacks in self-expression, but obviously keeps their usability issues and production costs in check. Players are restricted to creating similar, nice looking gardens, and this gives players clearer goals. Comparing goal setting in Gardenscapes to Fishdom shows this. 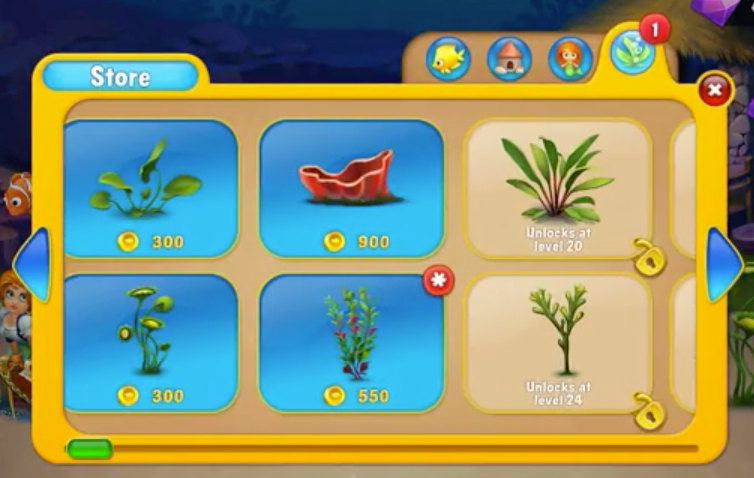 In Fishdom, players are allowed to spend their coins on as many decorations as they’d like, and progressing in the saga is only meaningful if you actually desire the content unlocked in the late game. Players can quickly feel overwhelmed with the choices Fishdom offers to decorate and spend coins. Also in fishdom, PlayRix constantly has to come out with new and desirable content — otherwise their players have little reason to grind. Gardenscapes however streamlines this process and always gives players limited choices: this is far more effective for casual audiences. Lastly, Gardenscapes chose the right approach when crafting the core loop. In order to unlock decorations in your garden or progress the story, players must trade in their stars for progress. Each star is earned by completing a level, an easy to understand system. This system could never monetize on its own, but because the match 3 core game can monetize and pace players so effectively — it never needed to. Gardenscapes have crafted a perfect core loop: Their decorations and narrative teases players to stick around for the long haul, while their core can effectively pace and monetize of its player base. 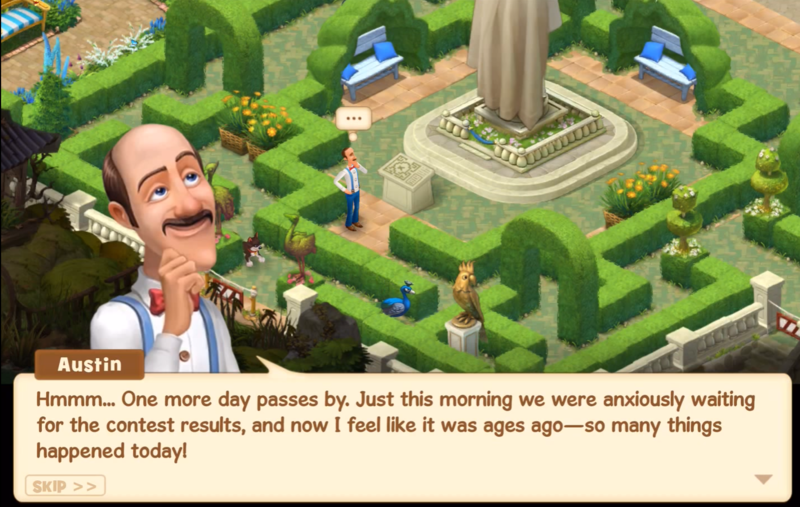 The success of Gardenscapes was a long time coming. PlayRix has been in the business of making successful casual games for nearly 14 years. So when Gardenscapes was soft launched in 2015 and didn’t meet their expectations, they did what most companies would never do: pivoted successfully to an entirely different genre. But how were they successful at this? PlayRix was a veteran casual game developer, through their history they’ve seen the cycles that casual game players go through. They knew that the audience would eventually hunger for a deeper layer of narrative and decoration. Their core monetization strategy relied entirely on the match 3. They do not allow players to purchase decorations directly (like most hidden object decoration games do) instead they relied on the core gameplay to drive monetization. Strong decoration + narrative aspects brought innovation to the match 3 genre. While adding these systems, the core success criteria for a puzzle game stayed intact. As a result, PlayRix have successfully merged the Hidden Object and Matching game genres, and pushed everyone in the matching genre to think twice about just blindly following the trend of saga based progression. Whether intentionally or not, PlayRix have turned heads in the matching genre. No longer are casual game developers believing that Saga is the only model. You’re already starting to see the trend take impact: more matching games have decoration & story at its core, more games are looking to combine new systems wrapping around a matching gameplay. Story Match, Chef’s Quest and Gemmy Lands. The fast followers to the Gardenscapes formula. Who will be the next developer who drives success? What will the next successful progression systems look like in the puzzle genre? I for one am excited to see what happens next.